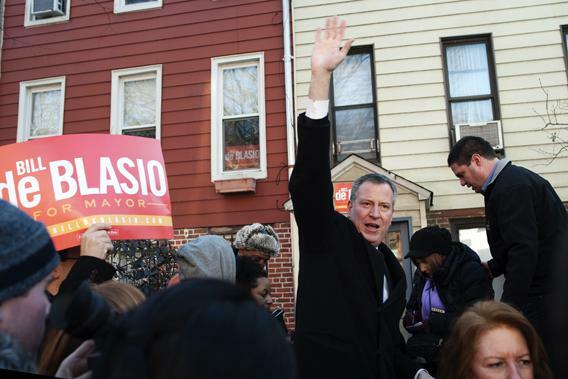 Bill de Blasio is the un-Bloomberg: Why the NY mayoral candidate is suddenly surging. Why is Bill de Blasio’s New York mayoral campaign suddenly surging? New York City Public Advocate Bill de Blasio waves after announcing his Democratic candidacy for mayor in Brooklyn in January. Bill de Blasio asks this of each potential voter as he stands outside of Trader Joe’s on 21st Street in Manhattan. He’s joined on the crowded sidewalk by two campaign aides and half a dozen volunteers. The potential voters are actually stopping to talk, and passersby end up waiting in line to speak with the mayoral candidate. A middle-aged man walks by and shouts, “This is the next mayor of New York City!” Cabbies honk and cheer as they pass de Blasio on Sixth Avenue. This is all very new to de Blasio. The city’s public advocate since 2009 and the most identifiably liberal Democrat in the race, de Blasio saw his poll numbers surge in the Quinnipiac poll taken immediately after Anthony Weiner’s latest scandal. In late July, he polled at 21 percent, up from 15 percent, putting him within striking distance of de facto front-runner Christine Quinn, and essentially tied with former City Comptroller Bill Thompson. The surge continued, as two weeks later the same poll puts de Blasio at 30 percent. He’s your new Next Mayor of New York. It’s a line he uses often, and it’s carefully chosen: The CEO is Mayor Michael Bloomberg, and de Blasio is the anti-Bloomberg, the empathetic, middle-class progressive who will roll back the legacy of Mayor Mike. Indeed, that legacy weighs heavily on each of the Democratic candidates, whose party has lived in the shadows of Mayors Bloomberg and Guiliani for a long time. It weighs heaviest on Quinn, the City Council speaker whose decision to let Bloomberg run for a third term is brought up constantly by the rest of the field as an example of the roll-over acquiescence to City Hall that has humiliated New York Democrats for years. Ultimately, the bottom line of the Democratic primary has become Quinn—the relative moderate who promises to do some things, but not all things, differently—versus the rest, who generally want to tear down Fortress Bloomberg and start over. De Blasio is warm with me—“step into my office,” he jokingly says as we talk under a Trader Joe’s awning—but gets prickly fast when it comes to discussing Bill Thompson. He’s loath to admit that the disappearance of Weiner has pitted the two directly against each other, but the two campaigns’ behaviors suggest that each man is well aware that only one of them will be moving on to a hypothetical runoff with Quinn. Getting rid of the NYPD’s stop-and-frisk policy is a cornerstone of the de Blasio platform and a frequent talking point. Thompson, the race’s only African-American candidate, has been harder to pin down on the issue: He publicly opposes the policy but has twice voted down City Council bills that sought to mitigate the effects of stop-and-frisk. So after Thompson gave a fiery Sunday morning church address condemning stop-and-frisk , de Blasio accused Thompson of trying to “have it both ways” on the issue. That prompted the Thompson campaign to fire back with a press release signed by black leaders calling de Blasio’s remarks “deeply offensive.” Thompson said himself: “For Bill to cheap shot me on stop-and-frisk and racial profiling? It’s insulting and Bill should know better.” De Blasio, whose so-called “modern family” (African-American wife, mixed-race children) garners a lot of attention, released an ad last week in which his teenage son Dante touts his dad’s opposition to stop-and-frisk. “He’s the only one who will end a stop-and-frisk era that unfairly targets people of color,” he says in the campaign’s first TV spot. That hospital story did make the Times, but only in the context of an article about de Blasio finally earning some media attention. If de Blasio manages to best Thompson and move to the runoff with Quinn, he’d suddenly find himself thrust in the national spotlight, which is unfamiliar territory for the career public servant. De Blasio proudly touts his progressive bonafides, such as a plan to tax every New Yorker making over $500,000 to fund universal pre-K. But the media hasn’t vetted him yet.